The Mean Well LCM series LED driver is a constant current type LED driver, available in 25W, 40W and 60W models. The beauty of these LED drivers is that they have a user selectable output. So one model of LED driver can work with a multitude of different LED light fittings. The MEAN WELL DAP-04 is a great low cost DALI to PWM converter that can be used with any MEAN WELL LED driver with MEAN WELL’s patented 3-in-1 dimming technology. When selecting a dimmable LED driver for use with LED strip, it is recommended that you select a LED driver with a PWM output. Is your LED Power Supply Safe? We have seen a worrying trend lately. Namely, customers requesting quotes for industrial enclosed power supplies to use as indoor LED drivers. 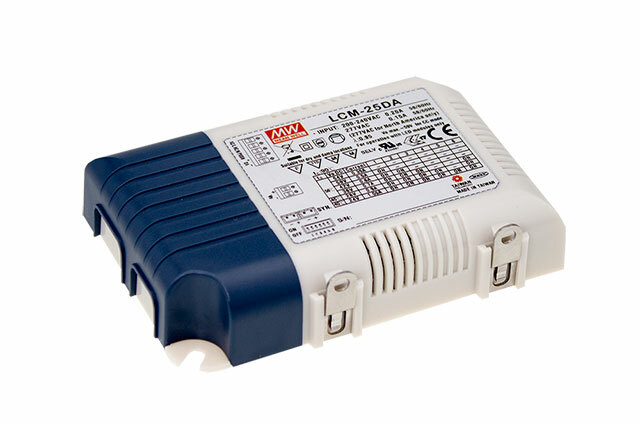 Power Supplies Australia stocks a wide range dimmable LED drivers. Using the Mean Well HLG series LED Driver in constant current mode. It’s worthwhile reminding LED driver users that the Mean Well HLG series constant voltage LED drivers can also be used in constant current mode. One of our most popular power supplies is the Mean Well GST series desk top type power adapter. Some exciting news from Mean Well this week. They are increasing the warranty period on the HLG series LED driver from 5 years to 7 years! Did you know that we stock both Constant Current and Constant Voltage a DALI LED drivers? 1-10VDC Dimming Pot Now in Stock! Power Supplies Australia is pleased to announce that we stock the Power Source D1-10 1-10VDC dimmer.